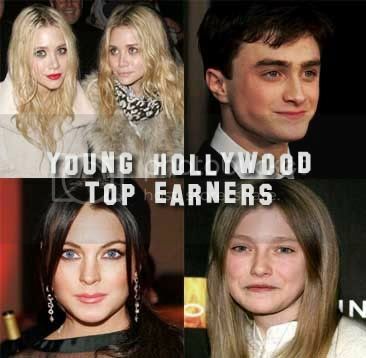 Forbes announces its first-ever list of Hollywood's top-earning stars under 21! In reversed order, they are... 10. Jojo Estimated Earnings: $1,000,000.00 Age: 16 Profession: Actress, Singer Known for: the movies "Aquamarine" and "RV" and the hit single "Too Little Too Late" 9. Tyler James Williams Estimated Earnings: $1,200,000.00 Age: 14 Profession: Actor Known for: the hit tv series "Everybody Hates Chris" 8. Abigail Breslin Estimated Earnings: $1,500,000.00 Age: 10 Profession: Actress Known for: the Oscar-winning movie "Little Miss Sunshine"
Known for: the tv series “What I Like About You” and the movies “She’s the Man” and “Lovewrecked”. Known for: the movies “War of the Worlds”, “Hide and Seek” and “I Am Sam”. Known for: the movies “Freaky Friday”, “Parent Trap”, “Georgia Rule”, “Mean Girls” and “Herbie: Fully Loaded”. Yep, Hilary Duff is not on the list.